Have you ever read through some of the Old Testament passages and wondered what it would have been like to live as a Jewish person in those days? The 613 commandments that they had to keep can seem pretty daunting. Yet, something that we fail to see sometimes on this side of history and as believers in Jesus, is that there was a stream of God’s mercy and grace that was present in and through the Law. This week we will see that mercy and grace played out in David’s life. David was a man after God’s own heart but as king, he committed an act that according to the Law, deserved death. He committed adultery and covered it up through murder. But as we will learn, God spares his life. Chris will share how God will respond to a repentant heart over a stubborn heart. In Psalm 51 we see how David saw the depth of his depravity and sin. David refers to God’s character, something that he knows because of his knowledge of Scripture. And we see that even though David deserves death according to the Law that was given to his people from God, God has mercy and grace and forgives him and spares his life. Why did God do that? Why didn’t God simply wipe David out and start again with another king? It is because of the promise God made to his great (x11) grandfather, Abraham. God chose to use the line of Abraham, which is the line of Judah, which is the line of David to bring the Messiah to bless the world! There’s the common thread we keep seeing as we take this journey through the Bible. It’s connecting us all back to Abraham. What a detailed-driven, compassionate God we serve! Steve Conover: When you think of the Old Testament, it's easy to focus on the law, the rules, and the obligations that the Israelites were commanded to follow. But have you ever considered the stream of God's grace that was present in and through the law? This is The Friends of Israel Today. I'm Steve Conover. With me is our host and teacher, Chris Katulka. On this episode, we're continuing our series called The Common Thread. Chris Katulka: Yeah. And the common thread, the series that we've been going through is something I've been personally excited about because it shows how God's promise to Abraham binds all of the Bible together from Genesis to Revelation. Today, we're going to look at the promise from a different perspective, actually, from the life of David, and how God invites even the worst sinners to return to him. Remember, because of the law, David deserved death, but in God's grace, through David's brokenness, God's plan wasn't thwarted. It's through David's descendant, Jesus the Messiah, that all of the families of the Earth would be blessed. Steve Conover: In the news, Israelis will cast their vote in two months to decide the party and Prime Minister that will lead their country. Election polls are currently showing two parties at the top of the list, Likud, led by Prime Minister Benjamin Netanyahu, and the new party rising to the top, the Israel Resilience Party, led by former Israeli Defense Force Chief, Benny Gantz. Chris, the polls are showing it's a close race. Chris Katulka: Yeah, currently the polling data is showing that Netanyahu really has his work cut out for him. Now, in the last election, Netanyahu's challenger was left of center politically. I'll be honest, most Israelis kind of a bad taste in their mouth for that brand of politics. But this go around, Netanyahu is facing IDF Chief Benny Gantz, who definitely has a strong understanding of security, given his background with the IDF and vows to unify Israel. So, we'll have to wait and see what the next few weeks hold for these two men, their parties, and Israel's political future. We've been going through this series called The Common Thread, and remember The Common Thread is an idea or a theme that's consistently present in several different areas or things. The Bible is this divinely inspired book. It's God's word that spans nearly 2,000 years with 40 different authors. Like I said last week, many of these authors, they didn't know one another. The Prophet Amos never sat down with a cup of coffee with the Apostle Paul to talk about how they'll share certain themes with one another to make sure the story ends just right. Or Moses never sat down with Luke, as he's writing his gospel, to make sure that this story is cohesive. No. God's word spans 2,000 years with 40 different writers, and it has a common thread. This is the amazing thing. It has a common thread that binds all the stories and the characters and the prophecies and all of the writings together. I believe that that common thread is found way back in Genesis Chapter 12, Genesis Chapter 15, Genesis Chapter 17, Genesis Chapter 22, and it's the promise that God made to Abraham. It binds the whole Bible together, and it's a promise that God would give the Jewish people a land. That's Israel. Descendants, of course. That's the Jewish people. And finally, a blessing, that God would bless those who bless Israel and curse those who take the covenant that God made with Abraham lightly. And that through Abraham and his descendants, this is the big thing about the covenant, that through his descendants, they would bring blessing to all of the families of the earth. Now, last week we looked at the story of David and Goliath. The story of a young David who displayed this unique faith in God that gave them the confidence to challenge a well-seasoned, tall, strong warrior Goliath. And last week, I argued that David's faith was a faith that stood in between a giant like Goliath and the faithfulness of God to His people throughout their years, and David knew God's faithfulness to Israel extended back to the promise God made to Abraham a thousand years before David. He knew God would bless those who bless Israel and curse those who curse Israel. And that's why he had that confidence to go out. Now, today I want to look at another element of the promise that God made to Abraham. It's the part of the promise that ensures God's plan moves forward despite our weaknesses and the weaknesses of the characters of the Bible, except except Jesus of course. But all the other characters display, I believe, the same weaknesses and frailty that we have as well. If you remember back in Genesis 15, God wanted to prove to Abraham that he and his descendants would in fact inherit the land that God promised. So, God tells Abraham to bring certain animals, and he splits them in half. After he splits them in half, Abraham, if you remember Genesis 15, he falls asleep. As he's sawing logs in the corner, that's when God walks through the pieces of the animal alone. God, in an ancient way, makes a covenant with Abraham and his descendants, and yet technically, God only makes the covenant promise with himself. It's His name on the title. Abraham and his descendants are only beneficiaries of the promise that God made with himself, and that's why the writer of Hebrew says, "Now, when God made his promise to Abraham, since He could swear by no one greater, He swore by himself." There was nothing that God could put up against or leverage against with this promise except for His holiness. That's the beauty of what God is saying here, the writer of Hebrews is saying about God when He made this promise to Abraham. And friends, when I think back about God's grace throughout the Bible, I think that this moment in Genesis Chapter 15 is a perfect example. God graciously benefits Abraham with a covenant promise that He and His descendants, the Jewish people, would inherit the land of Israel. It's an undeserved gift where God does all of the heavy lifting. It's His name. It's only His name that's on the oath. It's only His name that's on the covenant. It's only His name that's on the promise. It's pure grace poured out to Abraham, and I believe this aspect of God's promise gives God the ability to pour out His grace, even to disobedient people, even to weak people like us. I want us to take a look at the life of David again because last week, we saw David's strength when he conquered Goliath. But this week, I want us to look at the weak moments of David's life because you know what? All of us in our spiritual walk, we have moments of strength, and then we also have moments of weakness. If you remember David, he caught Bathsheba bathing on top of a rooftop. Sadly, he abused his power, and he took advantage of her, and he took advantage of her husband Uriah, who was a faithful soldier of King David. In the end, David kills off Uriah and marries Bathsheba to cover up his sins. Sins by the way, that have no sacrifice in Old Testament law. He should have been killed. David should have been stoned to death for murder and adultery. Now, after about a year's time or so, Nathan the Prophet challenges King David to see his sins that he committed, and David responds in 2 Samuel Chapter 12 like this. "I have sinned against the Lord," and Nathan replied to David, "Yes, and the Lord has forgiven your sins. You are not going to die." It's out of this low point in David's life that David writes Psalm 51. Just take a listen to this. "Have mercy on me, Oh, God, because of your loyal love." That's God's grace. "Because of your great compassion, wipe away my rebellious acts. Wash away my wrongdoing. Cleanse me of my sin, for I am aware of my rebellious acts. I am forever conscious of my sin against you. You, above all. I have sinned. I have done what is evil in your sight, so you are just when you confront me. You are right when you condemn me." See, here's what's amazing as I'm reading through this section of the beginning of Psalm 51, verses one through four. David is using God's words against Him. David is pleading for God to forgive him of his sin. Why? Because he remembers what God said about himself way back in Exodus Chapter 34. Remember, God said He was compassionate and gracious and patient and kind and forgiving, and David knows that about God, and he's saying, "I know that this is who you are." And now even though David is still going to face the consequences of his sins, God still wants His people to return to him. God wants His people to see the depth of their depravity and to turn to Him for forgiveness instead of remaining stubborn. I believe, because God made this promise with himself way back in Genesis, there is no one sin that can derail God's overall purpose to bless all the families of the Earth. No one sin or sins can derail God's overall purpose because like Abraham, David didn't link arms with God and walk through the pieces. It was God alone who made the promise to himself. The promise that God made to Abraham gives God the ability to exhibit grace and mercy and kindness to His people. And now, I'm not saying that David gets off scot-free. Instead, Nathan the prophet is telling David in 2 Samuel 12 that he's been forgiven, but he's going to face the consequences of his sin. But see, David's sin didn't thwart God's plan because it was only God who walked through the pieces. It's God who can offer the benefits of this promise to Abraham and his descendants. It's God who can offer the ability for his people to return and come back to him because they weren't there walking through the pieces to make the covenant. It's God's holy reputation at stake. And of course, let me state this. There is the law that God put in place, the law of Moses. Unlike the promise God made to Abraham, this law was binding on both God, who's the law giver, and the people of Israel. Israel agreed with God to follow the law. If you were to think about it like Genesis Chapter 15, they both walked through the pieces together. They were supposed to live up to the law under the standards of God. And as we know, you don't have to be a Bible scholar. Israel didn't follow the law, they didn't live up to God's standards. But think about this. It is this underlying promise that God made to Abraham that runs almost underneath the law that God gave at Sinai. That even though Israel disobeyed God and fell away and became like a spouse who cheated and chased after false gods, they broke the law, and were punished according to the law. But that never meant that God's plan and purpose was over for them. God constantly was inviting Israel to return to Him in the midst of their sin. To come back to him. To find joy in him. To find hope in him. To find rest in Him. Why? Because God's promise to Abraham is timeless and eternal, and Abraham's name isn't on the promise. Only God's name is, so God has to fulfill this promise. This is why the prophets always talk about judgment for Israel's sins, but then at the same exact time, never leave them without the hope of redemption. The hope of returning to Him and finding salvation and peace in Him. When we return, we're going to go a little bit deeper into how God redeemed David's sin and how God would use David to continue the promise that He made to Abraham. Steve Conover: We'd like to share with you a book that has been helpful to us here at The Friends of Israel in our own studies, Charting the Bible Chronologically. This hardbound, full-color piece by authors Ed Hindson and Thomas Ice gives you a panoramic view of the events recorded in Scripture. With more than 40 charts of timelines and overviews of major empires, Bible characters, and events throughout history, we know you will enjoy it and reference it as much as we do as you study God's Word, both privately and in a group. 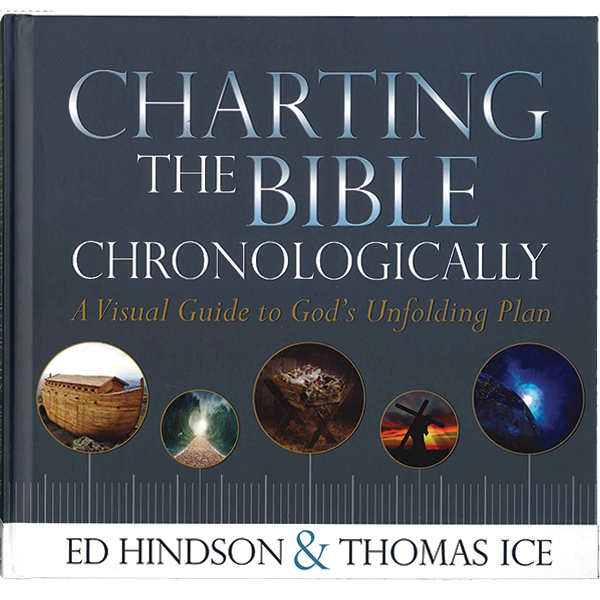 To order your copy of Charting the Bible Chronologically, go to foiradio.org, or call our listener line at 888-343-6940. That's foiradio.org, or call us at 888-343-6940. Chris Katulka: Welcome back everyone. We've been talking about God's timeless eternal promise to Abraham and how this promise is unique because it's only God whose name is written on the promise. Therefore, no one sin can thwart God's overall plan to make sure that this promise made to Abraham finds its fulfillment. We looked at how God structured this promise. We saw that it provides grace for His people, to realize their wrongdoings, and to return to Him. God's character, think about this. God's character is a character of forgiveness. Embedded in God's character, is forgiveness and kindness and patience and mercy. And you know what you see throughout the New Testament is that God is calling us as believers in Him through Jesus the Messiah, to embrace through the spirit, those same exact qualities. You know, I think it's easy for us in our human flesh to be people of revenge and to push people away, but really, God calls us to be people of forgiveness, to have the qualities that He has. Now, as we're getting back, this doesn't mean that our sins are overlooked and that we don't have to pay for the consequences of our sins. But what I'm saying is that God's promise to Abraham shows that God is always opening the door for us to return to Him. God told Abraham, "Through you, all of the families of the Earth will be blessed." And a thousand years later, David, a descendant of Abraham, is told that a descendant of his would come from him who would establish God's kingdom forever. God's essentially telling David that "Through you, David, will come the one who will bring the blessing to all the families of the Earth. That all the nations will one day be ruled by one of your sons, David. The Messiah, David, is going to come through you." God's promise to Abraham actually continues on in the life of David, and yet David's sins never thwarted the overall plan of God. He paid dearly for his sins, but God forgave him and continued to use him because it's God's name. Think about this. Again, it's God's name written on the promise to Abraham. It's not Abraham's. It's not David's. It's not Saul's. It's not the sons of Israel's. It's not Joshua's or Moses or Joseph or the 11 sons or Jacob or Isaac. It's none of them. It's only God's name who's written on the promise. It's His holy reputation at stake. He says that, actually, in Ezekiel 36. When God is returning, Israel makes a promise that he'll return Israel to the land. He tells Israel, "You don't deserve this. It's not because you are the best. In fact, you don't deserve any of this, but because of my holy reputation that's at stake, I'm going to make it happen." Read it. Ezekiel Chapter 36. I want you to think about this for a moment. The Savior of the world, the Redeemer, Jesus Christ, the one who invited all the families of the Earth into a relationship with the God of Abraham, Isaac, and Jacob. He doesn't come from a perfect human lineage. You know his family history is nothing to be envious of and yet God's plan was never thwarted. Folks, David was a man after God's own heart because he recognized his sin and in his brokenness, he returned to God, knowing that God was and is and will be gracious and kind to forgive his sins. God's promise to Abraham isn't dependent on anyone but God. It's not going to radically disappear one day. It is timeless and eternal. And folks, I don't know where you are in your walk with the Lord right now, but I know this much. God's redemptive plan, globally and on an individual level with you, isn't thwarted by our failures. But the way God uses us can be changed by our pride and our stubbornness to return to Him for forgiveness. But again, once again, His overall plan will never be thwarted. And I'll end with this. God's promise to Abraham becomes always the foundation to return to Him. I'm reminded of what Paul says to us. "Those who believe in Jesus Christ, those who believe in the one who would bless all the families of the Earth." I'm reminded what he says in Philippians Chapter One. He says this. "For I am sure of this very thing." This means Paul is extremely confident, “that the one who began a good work in you will perfect it until the day of Christ Jesus.” Even in our ups, everybody, those strengths that we have, that we see like David when he conquered Goliath, and even in our weaknesses, God is going to continue that good work that he's started in us. He sees the end because it's His name written on the promise. It's His name that must make sure this thing gets completed. That's why we can have confidence in the ups and downs of our lives, that God will use us. But the one thing He wants from us is not our pride, not our stubbornness, but our brokenness and weakness to turn to Him. Mike Kellogg: For many days, I had been asking myself, "How do I find people like me who survived the Holocaust so that I may bring them the gospel of Christ?" Speaking to them about faith is not easy. They do not want to hear about the Bible. But as we say in Israel, if God wills it, even a broom can shoot. Recently, a friend came to my home to ask for my help. "Zvi," he said. "I know a 90-year-old man who is a Holocaust survivor and does not want to hear about the Lord. Would you please come and speak to him? He only wants to speak with people who have suffered as he did because only they understand what he's going through." "I'm ready," I said. So, I went to his home with my friend. We talked for quite awhile and began to develop a friendship. I asked him how he dealt with all he endured during World War II, and I listened to his reply. Then he asked me the same question. “In the beginning”, I said, "It was very hard for me, but over time, I started to read the Holy Bible and grow closer to the Lord, and he gave me hope and the courage to go on living. During the Holocaust, I was jealous of those who died. I was 10 when the Nazis came through Poland where I lived. I was separated from my family and have never seen them again. When the war was over, I came to Israel, and someone gave me a Bible. I read Psalm 27:10 where it is written, 'When my father and my mother forsake me, then the Lord will take care of me.'" "He gave me courage to live and even enabled me to encourage others who walked that same long road of suffering, and here I am today, no longer suffering because I put my trust in the Lord." He had many questions, and I told him how I came to know the Lord personally. At the beginning of my visit, he was extremely distraught, but he paid great attention to everything I said. And in time, I saw great joy appear over his face. Then I opened the Bible and began to read to him. He listened, and I could sense the Lord's presence. I have spoken to other Holocaust survivors, and they all asked the same questions. "How can you speak about faith in God? You know what I have lived through? Where was God then?" I asked him, "How old are you?" "I am 90 years old," he replied. "And who gave you this long life, if not God himself? You could have died in Europe, but He brought you here and has taken care of you. So, if you want to know where God was, look at yourself. He was with you the entire time so that you should come to know Him and tell others about Him." I showed him how God had blessed His chosen people by giving us back the land He promised to us and to our descendants forever. Despite all we've gone through, God has not forsaken us. As it is written, you are my servant, Oh, Israel, in whom I will be glorified. Steve Conover: Thanks for joining us today. Reflecting back on Chris's teaching, I hope you are seeing how your faith is connected to God's promise to Abraham. Chris, can you remind our listeners how grace can be found in this promise? Chris Katulka: Yeah. If you remember, we went back to Genesis Chapter 12 and Genesis Chapter 15. And when God set up the covenant to Abraham, He was the only one who walked through the pieces. What that was showing is that God's reputation is at ... His holy reputation is at stake. Abraham's name wasn't written on it. David's name wasn't written on it. Your name's not written on it. If it was, this whole thing would fall apart. But see, because it's only God's name, that means that He has the ability to invite us. Even when we sin, even when we fall, that He has the ability to invite us back into a relationship with Him because it's His name written on the deed, it's his name written on the promise. Not ours. And so that gives us the ability to return to Him, and He always invites us back by grace. Steve Conover: Thank you, Chris. We look forward to hearing more next week. Our host and teacher is Chris Katulka. Today's program was produced by Tom Gallione, co-written by Sarah Fern. Mike Kellogg read Apples of Gold. Our theme music was composed and performed by Jeremy Strong. I'm Steve Conover, Executive Producer. The Friends of Israel Today is a production of The Friends of Israel Gospel Ministry. We are a worldwide Christian ministry communicating biblical truth about Israel and the Messiah while fostering solidarity with the Jewish people. Zvi admitted it is not easy sharing the gospel of Jesus to his people, because most do not want to hear it. Recently a friend came to his home and told him about an elderly Holocaust survivor who would not speak about spiritual things with anyone else but another survivor. Zvi, being a Holocaust survivor himself, agreed to speak with the man. Their conversation will show you how God works through his people.